Calling all strawberry lovers! 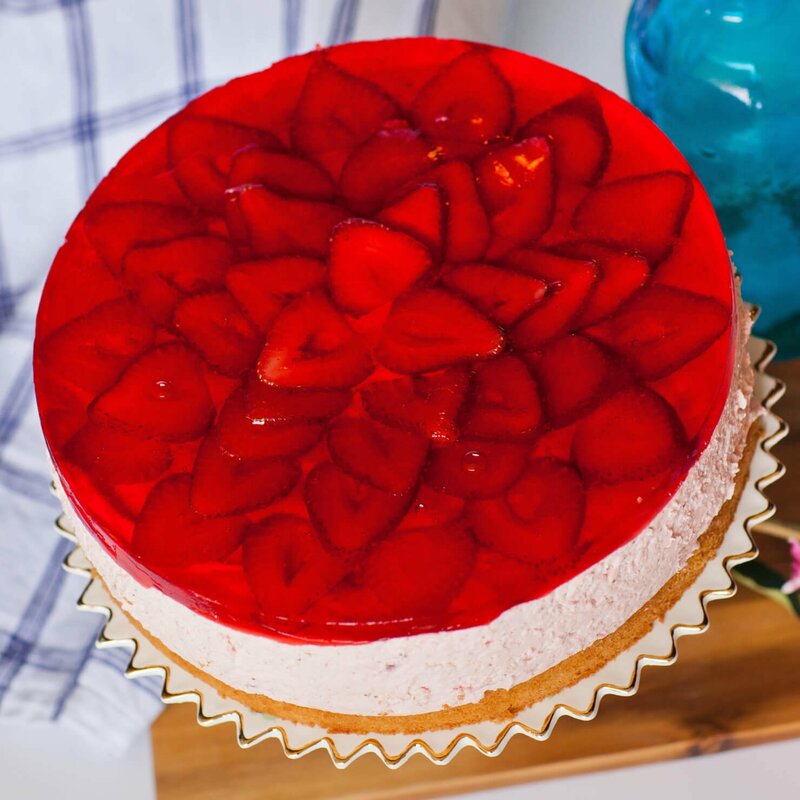 If you love strawberries as much as I do, you’ll love this show-stopping, stunning strawberry mousse cake! It’s the ultimate strawberry dessert! And check out that intricate strawberry topping! It looks so fancy and I’ll show you how to make it in my video recipe tutorial. 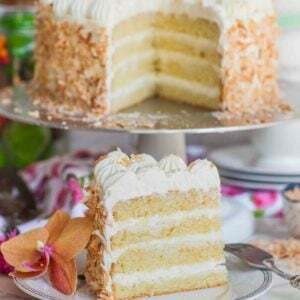 If you’re looking for a light and airy cake to enjoy, give this one a try! 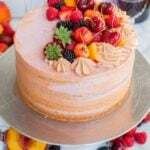 This cake is loaded with TONS strawberries, starting from the sponge cake base, a double dose in the strawberry mousse and more berries to finish off the top. I make this cake with a simple sponge cake base that’s dotted with diced fresh strawberries. You can also soak the sponge cake with crushed strawberries. Then, it’s the mousse layer. This strawberry mousse is simply heavenly! It melts in your mouth with soo much fruity flavor! 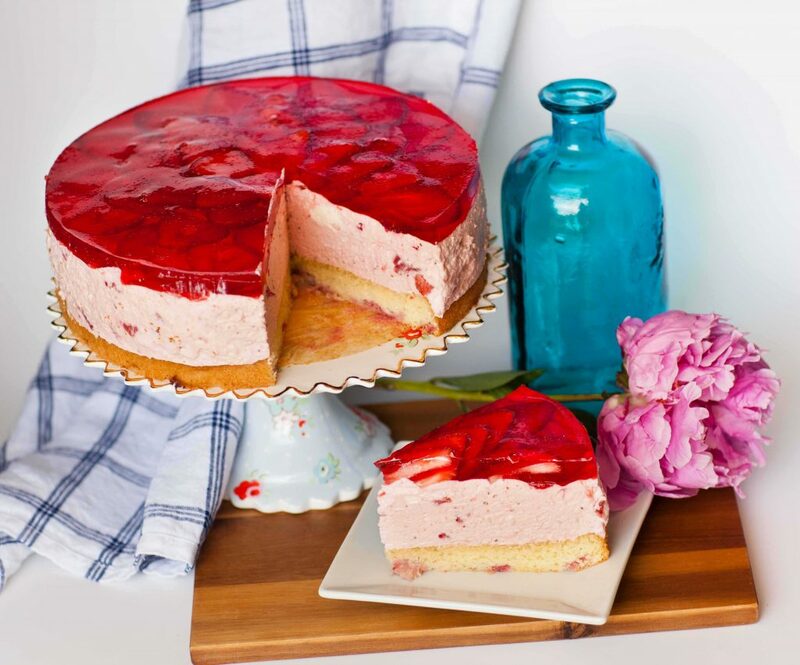 To take this strawberry mousse cake to extraordinary, I added the strawberry jello topping. The design is made with sliced strawberries, which not only look gorgeous but also add even more strawberry flavor! 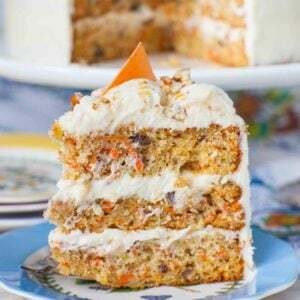 This is a great cake to make ahead of time, too. Just keep the cake in the springform pan until you’re ready to serve. This way, the jello and mousse keep their shape well. 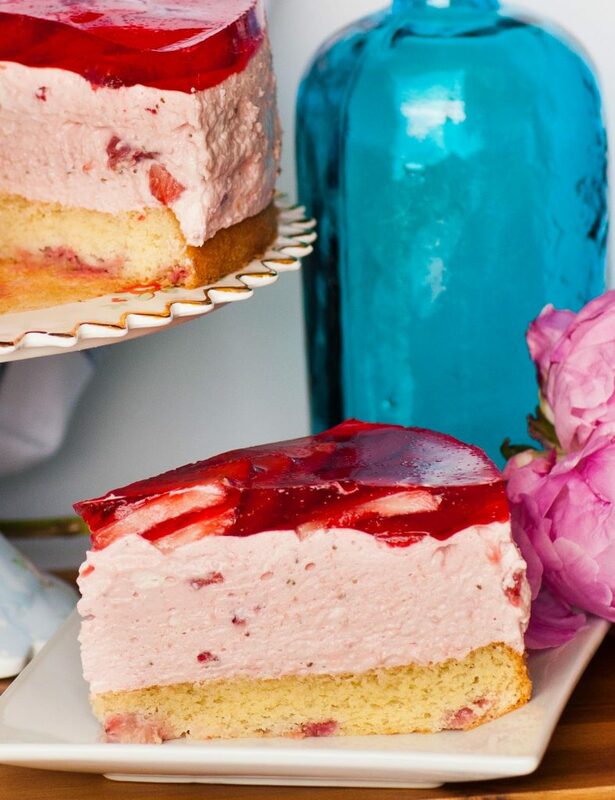 Every slice of this delicate mousse cake is packed with strawberry flavor! It’s light, fluffy and fruity! Try using an acetate cake collar for a smooth finish – just cut the bulk roll down to size. Prepare the sponge cake base first. Line a 9 or 10-inch spring form pan with parchment paper. Preheat oven to 350F. Place the eggs and sugar into mixer bowl and whisk on high speed for 7 to 8 minutes until eggs are very voluminous and almost white in color. In a separate bowl, combine the flour and baking powder. 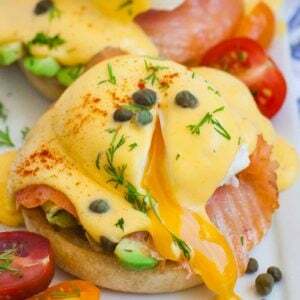 Sift small amounts of flour into the eggs and fold gently but thoroughly after each addition. Fold in the diced strawberries and vanilla extract at the end. 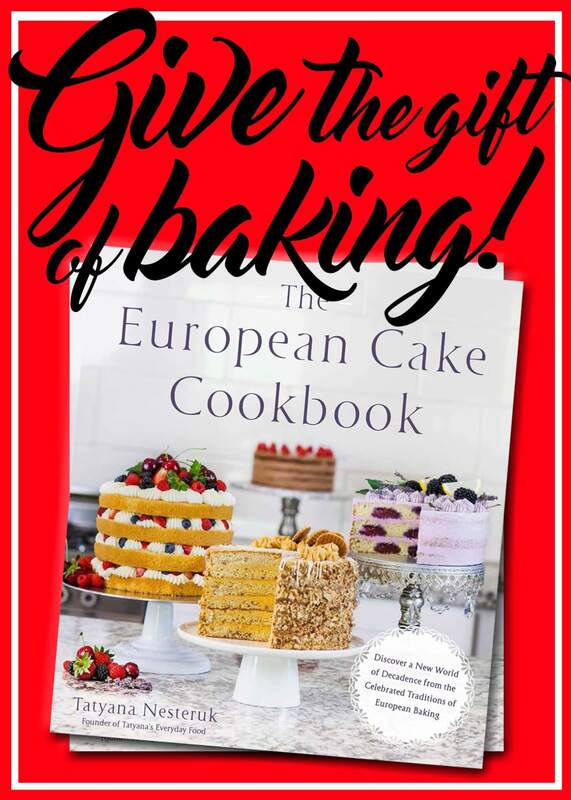 Pour the cake batter into the prepared spring form pan and bake in preheated oven for 18 to 20 minutes or until the top is golden brown. Remove the cake and allow it cool. Meanwhile, prepare the mousse. Place the strawberries, strawberry extract and sweetened condensed milk into a food processor and pulse into a puree; set aside. Pour the heavy cream into a mixer bowl and add the sugar. 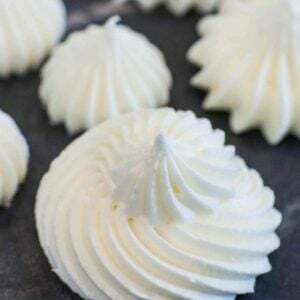 Whisk until a light and fluffy whipped cream forms. Add the softened whipped cream cheese and whisk until smooth. Fold in the strawberry puree and add the diced strawberries. Combine the water and gelatin in a small saucepan or microwave safe cup. Heat or microwave the gelatin until it's completely dissolved. Add the dissolved gelatin into the mousse and fold until combined. Pour the prepared mousse over the cooled sponge cake. For the garnish, slice about 15 strawberries and arrange them overlapping each other, starting from the outside edge and working in. Refrigerate the cake for about 1 hour. Prepare the strawberry jello with half of the water required per instructions. This will ensure the jello layer is firm. Pour the jello over the top of the sliced strawberries. 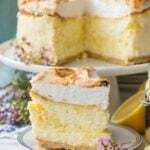 Place cake bake into the refrigerator until set completely. To remove cake from pan, run a flat spatula along the edge, then release pan. Can I substitute the strawberry extract with anything else and where can I get it? Would this work with raspberries instead of strawberries? What can I use as an alternative to the strawberry extract? Also in your tiramisu cheesecake you had liquor…what alternative can be used for liquor in your recipes? This cake is fantastic! I was thinking of trying it with peaches. I noticed the recipe wasn’t the same as your peach mousse cake, can I use this recipe with peaches? 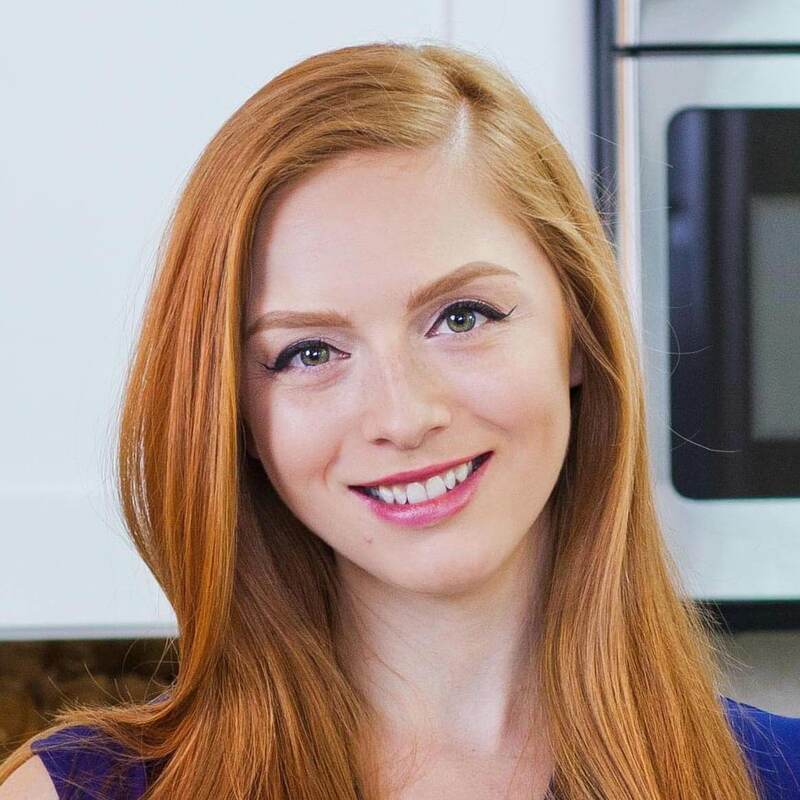 Hi Tatyana! Where do you buy your extracts and liqueurs? Is there a one stop shop? Thanks. Hey I accidentally messed up with the gelatin for the moose I forgot to put it in so then I took the cake out and accident read the recipe wrong and put one cup of water with it but I only pour about a 4 th into the moose for the cake because 1 cup just didn’t seem right do you think it’ll be fine?? This recipe looks amazing, i’m going to try it for a dinner party. Can you tell me how much gelatine i will need in grams? I’m considering this desert for Thanksgiving. How many days in advance can I make this cake prior to serving? Made this last night per request from my daughter for her Birthday. The instructions for the unflavored gelatin seem to be vague. I’m now realizing that they should have said 1/4 cup water PER envelope of gelatin?? I made this cake as per the instructions . 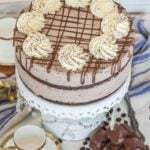 It looked beautiful and tasted great but my mousse was too soft and did not hold very strongly. What could have gone wrong ? 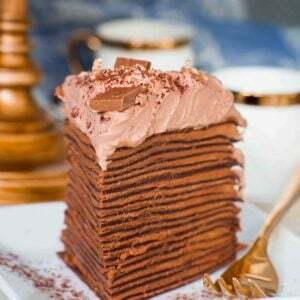 You and your cake are stunning:-) Could you please tell me how deep of your bake tin for this cake? Tatyana, I have made this recipe about 5 times already and it’s abosutely delicious. However, every single time I am running into the same issue with the mousse being too liquidy. Even comparing the texture before adding the gelatin, mine is always much more watery than yours. Every thing looks great until I put the cream cheese into the mixture with heavy cream and sugar. Maybe I beating it for too long? I guess after whipping the whole cream…how long do I whip the cream cheese into it? It just looks so flat when I’m don’t with it. Hi! 🙂 I’m glad you still enjoyed it even with the texture issues! Make sure to whisk the heavy cream first to soft peaks, then add the cream cheese. It really shouldn’t take too long, maybe a minute for the cream to form stiff peaks. Wonderful! So glad you enjoyed the recipe! Can I substitute the base with biscuit crumbles or with a store bought sponge cake? 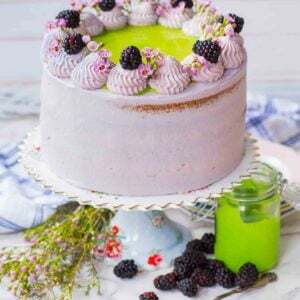 Again the same doubt to be raised, would you suggest this cake or your recent raspberry mousse cake to be the most festive one for occasions? I just made this cake tonight for the first time. It looked great before cutting. As soon as I cut into it, the mouse was too soft and kind of collapsed. It tasted good though. I followed everything exactly. Not sure what went wrong. But im guessing it has to be due to the gelatin. Maybe not enough? I weighed 1/2 ounce of gelatin powder on my scale and and it didn’t look like much. Could gelatin be substituted with agar agar? If so then how much agar agar would I need for this recipe? I made this cake as per your instructions, and although it has a wonderful taste, my mousse was too soft and did not hold at all. I’ve noticed that several others have had this exact same problem, and I can not figure out why it looks so different from yours. I used 2 packets of Knox unflavored gelatin and dissolved it in 1/4 cup of water over the stove. The second time I made this I double the gelatin/water ratio and still had the same outcome. I am totally lost as to why this recipe won’t hold. I’m so sorry that the recipe didn’t work well for you! I can only think of one reason for why the gelatin didn’t set and that would be acidity. Maybe the strawberries you used weren’t very ripe and had too much acidity, which prevents gelatin from setting. Maybe try this with low-sugar strawberry preserves? IS IT OKEI TO FREEZE THE CAKE? IF IT IS HOW LONG IS GOOD FOR FROZEN? IF NOT HOW LONG IS IT GOOD FOR REFRIGERATED? Hi! I do not recommend freezing this cake, jello and heavy cream do not freeze well. It will last up to 4 days in the refrigerator. I would keep it in the pan, then take it out onto a stand when you’re ready to serve. Hey I tried the recipe and it turned out to be Awesome!! can this mousse be frozen ? i want to make mirror glaze cake with this mousse. I just made this cake and everything tastes amazing but my sponge rose to high. I could only put in half the mousse to leave room for the strawberry garnish. Do you know what I did wrong?